As a condo-style resort located in stunning North Scottsdale, the managers of Scottsdale Villa Mirage strive to ensure that each aspect of the property enhances security, aesthetic appeal, and guest satisfaction. They found that one detail had become bothersome: a gate that allowed unwanted visibility between Scottsdale Villa Mirage and a neighboring property. The managers decided to consult DCS Industries about installing a new gate that would control access, enhance curb appeal, while improving privacy. 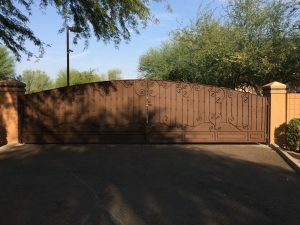 After speaking with the Scottsdale Villa Mirage team and examining the property, the professionals at DCS Industries built and installed a new gate that would solve the managers’ concerns. While the previous gate had a simple style with wide gaps between the wrought iron bars, the new gate is solid with no gaps. DCS Industries also welded on a privacy strip between the gate’s two halves so that passersby cannot see through it. With an impressive size of 30 feet wide, the new gate completely seals off this entryway to Scottsdale Villa Mirage—yet it can easily allow the passage of large vehicles when necessary. After installation, DCS Industries worked with the local fire inspector to determine the proper location for Knox boxes, which grant emergency services personnel easy access to the property. This is just one example of how our team works closely with each client to provide a fencing or gate solution that meets the property’s unique needs. With over a decade of experience working with commercial and industrial properties throughout the greater Phoenix area, DCS Industries is adept at creating high-quality wrought iron products to suit various styles and preferences. Call us today at 623-825-7700 to request a free estimate!